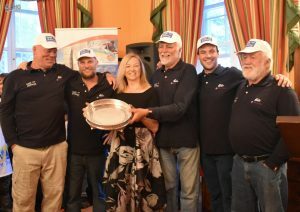 HE Governor Lisa Honan hosted a presentation for the Cape to St Helena Yacht Race participants, where she also presented the Governor’s Cup to the winning yacht, at Plantation House, on Friday, 11 January 2019. 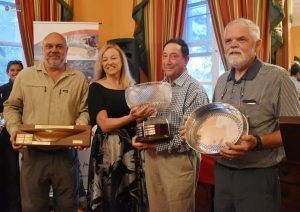 Race Chairman, John Levin, also presented Royal Cape Yacht Club Platters to various individuals and institutions in appreciation of their assistance in making the Cape to St Helena event possible. Certificates were presented to the skippers and crew of sailing vessels – Indaba, Felix, Naledi, Caribbean Soul, Banjo, Compromise, Ronin, Carpe Diem, Avocet, Asante, Yolo and Rocket.